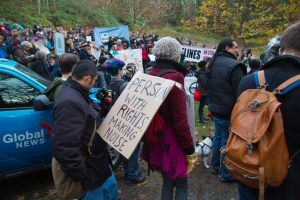 Over the past few weeks, we’ve received several calls from the media asking, “What are the consequences for people who are arrested at the Kinder Morgan protests?” Before answering this question it’s important to highlight the role that protests and civil disobedience play in a healthy democracy. Protests and civil disobedience have played an important role for social and political change throughout our history. The Canadian Charter of Rights and Freedoms guarantees the right to freedom of expression and freedom of association. While there are reasonable limits to these rights, courts have commented that protests and demonstrations in public places are highly protected forms of expression. There have been instances in human history….in which disobedience to law has proved a benefit to law and to society. their purpose must be to expose the law breached to be immoral or unconstitutional, in the hope that it will be repealed or changed; or in the hopes that the law or administrative decision will be repealed or changed. Most protests and demonstrations are peaceful and lawful, with no arrests. Where you run the risk of arrest is when you breach a term of a court-ordered injunction. An injunction is a powerful legal tool in the context of protests and civil disobedience. It is a legal remedy granted by the court, in the form of a court order, to prevent interference with the legal rights of a person, company, or government. If you breach one or more of the terms of an injunction, you may be arrested and charged with either civil contempt of court or criminal contempt of court. Charges of civil contempt are far more common than those of criminal contempt in British Columbia. Did the court issue an injunction order prohibiting certain acts? Did the particular accused know about the terms of the injunction order? Knowledge includes willful ignorance. Did the accused do one or more acts amounting to disobedience of one or more of the terms of the injunction? Disobedience must be deliberate or willful. Did the particular accused know about the terms of the injunction order? Knowledge includes willful ignorance. Did the accused do one or more acts amounting to disobedience of one or more of the terms of the injunction? Disobedience must be deliberate or willful. Did the conduct of the accused amount to a public defiance or violation of the order so as to make the contempt criminal as opposed to civil? The conduct must bring the administration of justice into disrepute or scorn. The potential penalties for civil and criminal contempt are the same. You may receive a fine or, in exceptional cases, jail time. Or, you may appear in court and charges will be stayed. The conduct involves violence resulting in physical harm or assaults with a reasonable apprehension of physical harm. Serious property damaged has been caused or there is property damage with a reasonable apprehension that serious property damage will be caused. Persistent less serious offending is significantly disrupting public access to, or enjoyment of, lawful public activities. An assault on a peace officer has occurred. The circumstances are such that the public interest clearly requires a prosecution. For instance, where the safety of emergency personnel, police, or other persons is jeopardized. 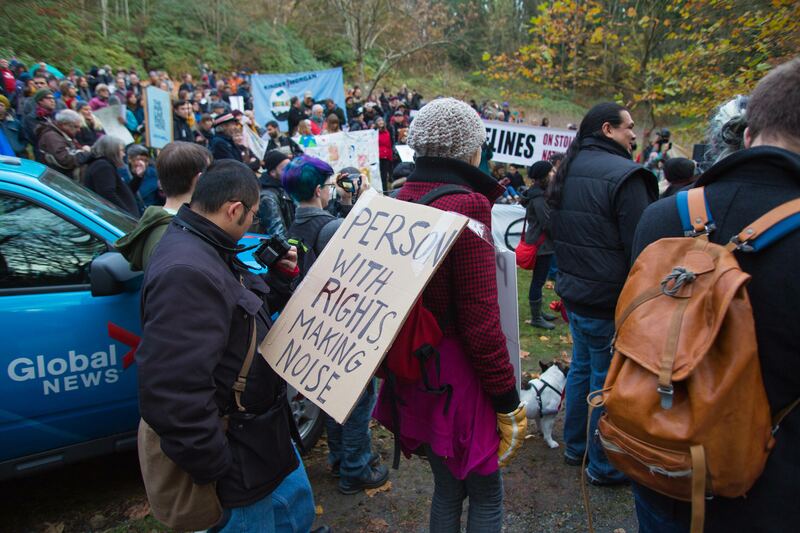 While every circumstance is different, we can learn from the latest series of arrests on Burnaby Mountain. The majority of people who have been arrested are released by police on a promise to appear in BC Supreme Court for a charge of civil contempt of court. These promises to appear contain conditions not to further breach the terms of the injunction. If you sign the promise to appear, and agree to abide by the conditions, you will be free to go. But, you will need to appear in court on the date noted. If you do not sign the promise to appear, and do not agree to abide by the conditions, you may be detained until the court date. Most of the court dates for the people charged with civil contempt of the Kinder Morgan injunction are set for June of this year. To date, a small number of people have been charged with criminal offences. you join a professional association or accreditation body. Canadian police agencies have information-sharing agreements with international policing and border services agencies, such as US Homeland Security. While non-conviction information is not supposed to be released to these agencies, there are cases where people have been refused entry into other countries based on such information. If you are convicted of a criminal offence, that offence will certainly be shared. Depending on the country, you may be eligible to apply for an entry waiver if you are refused entry. Another potential consequence of being arrested is if you are a non-citizen of Canada. In certain cases, your immigration status may be affected by criminal charges or convictions. You may want to consult with an immigration lawyer prior to participating in acts of civil disobedience that have the potential to result in criminal charges. If you plan to participate in a protest or an act of civil disobedience, know your rights! Read Leo McGrady’s Guide to the Law of Protest in BC here. It is an invaluable resource that informed much of this post. Challenges to the rule of law, January 14, 1971, Empire Club, Toronto, Ontario; also cited in (2014) 37 Manitoba Law Journal Special Issue – a Judge of Valour- Samuel Freedman – In His Own Words, page 204. Although it is considered a criminal offence, this specific offence is derived from common law and not listed as an offence in the Criminal Code. Next Post: We’re hiring: Join our team as our new Articling Student!